After doing some housekeeping on learner's data like some correction on your name, birthdate; correction of LRN and even deactivation of your LRN due to its multiplicity, teachers may not proceed to updating their learner's data for the end of the school year (EOSY). Those activities are usual job for a public school teachers, even it is even facilitated by their school ICT coordinator and duly approved by the school head. On the case of multiple LRN deactivation, the central office has to approve and effect the needed deactivation. And these things fall in the beginning of school year (BOSY). And in return, these will be finally reflected to their respective school data in Enhanced Basic Education Information System (EBEIS). 1. To reflect the status of learner, proceed to the list of learners and select a learner by clicking a pencil icon beside "no status" button. A Gen Ave of individual learner could be seen there, except for Kindergarten which has no grading facility. Here in Learner Profile, you can update the update other data, request correction, section and status. On "Update Other Data", you can update learner's Guardian, Mother's maiden name, Father, Residence, Religion, Ethnicities, Mother Tongue/Dialects. On "Request Correction", you can ask for Correction of basic profile, Correction of grade level, Correction of LRN, and Deactivation of LRN. IMPORTANT! 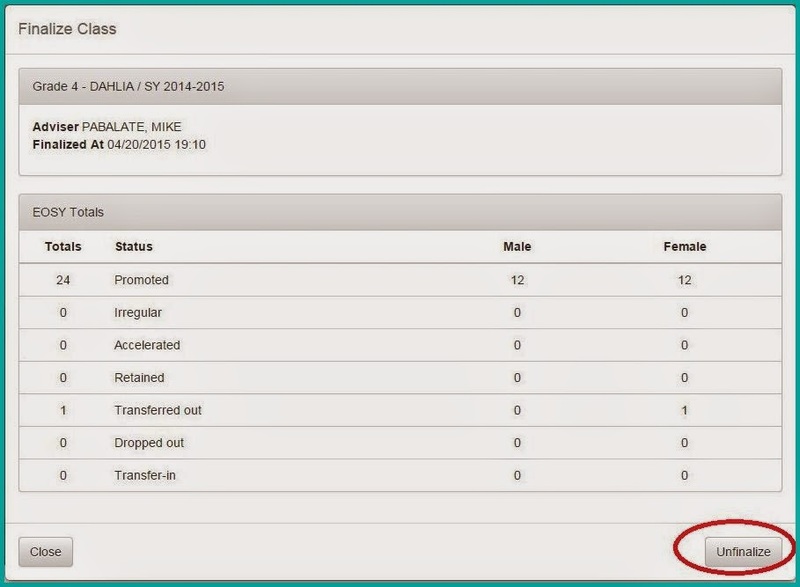 As a default, learners status whose enrollment is "No Status" is automatically promoted. 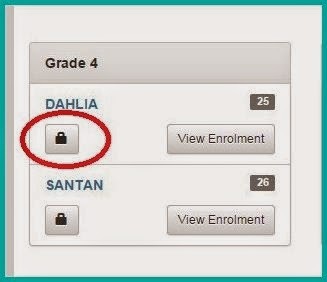 Should you update the enrollment of the learner, you have two choices, such as "Section" button, and "Status" button. "Section" button is used to transfer a learner with the same class but different section. "Status" button indicates an option for No Status for Promotion, Retained, Transferred Out, and Dropped Out. No Longer in School (NLS) is no longer available. No retained status for Kinder. And also the Honor Student status of the learner and General Average in 3 decimal places. Kinder has no grading facility. Transferred Out indicates earner has transferred. There are style of schools to select. Dropped Out indicates the reasons why the learner has stopped from schooling. There are also options to select. 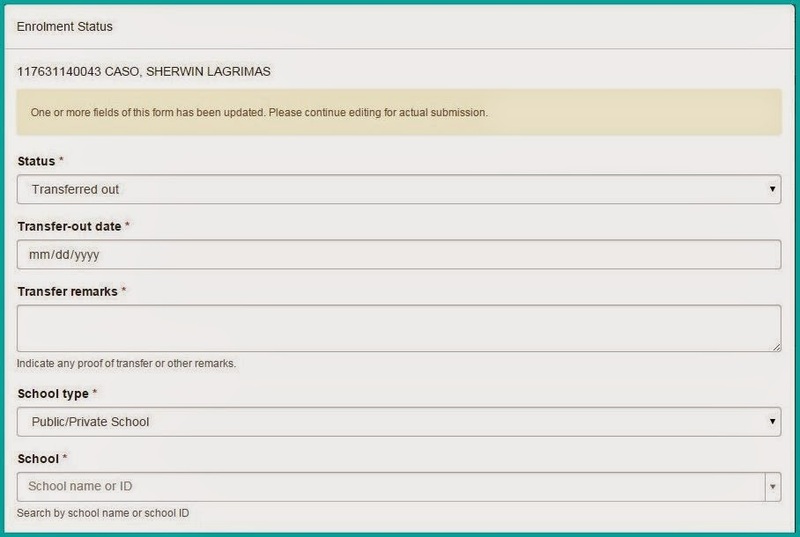 After you have updated your individual learner's status, you may proceed to finalize your class. IMPORTANT! Before he clicks the "finalize" button, he should see to it that all conditions are accomplished. Once finalized, there's still an option to "unfinalize" the class in a situation where the general average of the learners has not been encoded. After the class been "finalized" with a lock icon, the school system admin or the school head may "unfinalize" it by clicking the lock icon below the class name. Going back to your masterlist, a summary of all your learner's statistics are displayed. 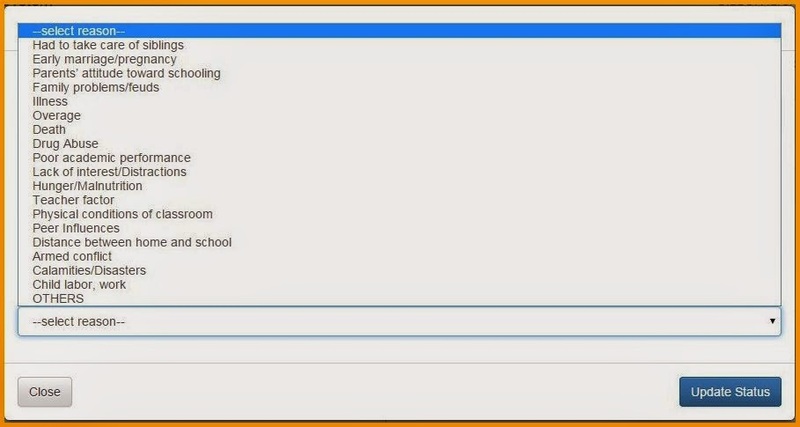 Go to "school forms" button to print out the needed school forms like SF1, SF2, SF3, SF4, and SF5. From your LIS dashboard, click "list of classes". From "List of Classes", click "End of School Year" button to finalize the school enrollment. In short, the school enrollment couldn't be finalized unless the data issue is completely resolved. 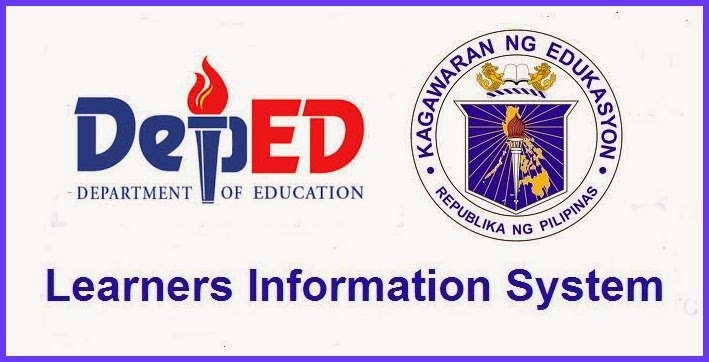 Should you have any queries related to LIS especially on EOSY updating, you may refer them to LIS Help Desk, SFRT or DepEd ICT Coordinators Page on Facebook. sir bakit sa account ko sa LIS di padin ako makapag update ng status..na deploy naba ang EOSY? Hindi pa sir... di ka kasi nagbabasa sa mga updates sa LIS Help Desk, sa DepEd ICT Coordinators FB page eh. Sabi roon mamayang gabi pa, kaya gumawa na ako ng tutorial para mapadali ang trabaho ng mga teachers. Sir Paano po ang pagpasok sa LIS Housekeeping? Bakit? Anu ba ang problema natin? Teacher ba kayo parang di mo alam yata ah? sir, how about the learners who transferred to ALS? ano po status nila? T/O po or D/O? They're considered dropped out, Mam. kelan b tlg mgiistart yng promoting facility n yan?????? sir paano yung irregular status? Ang irregular status ay para sa secondary. Meron silang back subjects. Ang irregular students ay walang grades sa LIS kagaya ng mga retained. Sir meron instances maling spelling ng pangalan dahil huli ng dumating ang NSO copy ng birth certificate. O di kaya hindi nilagyan ng general average ang mga pupils. Pwede pa rin. He will advice or authorize the school system admin na sya ang gagawa ng edit at update ng pupils ng OIC. By the way, meron bang -character na school ID. Anu yan private school? gud pm sir.pwede pa po ba magcorrect sa spelling ng mga pangalan ng learners? Pwede pa po bang icorrect misspelling ng mga names ng learners? pwede pa po itransfer ngaun ang kinder sa ibang school? tatanggapin pa kaya sya? good pm po. i have erroneously encoded the transferred out of one learner. may paraan po ba para mabago yon? the school where the pupil transferred to asked it to be corrected po kasi. 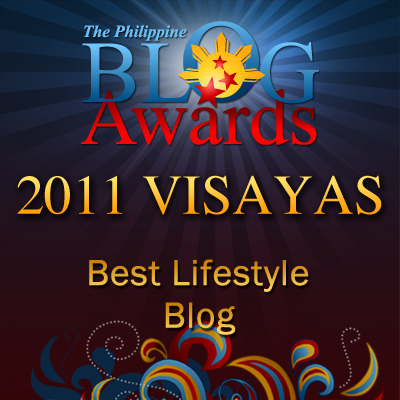 thank you very much po. hello sir..bakit po na riresolve yung pending issue ng LIS namin?? hindi tuloy kami makapagfinalize. hello sir..bakit hindi po nariresolve yung pending issue sa LIS ng school namin?hindi pa din kami makapagfinalize. Sir bakit hindi po maresolve yung pending issue namin? sir pano po kung na finalised na ng head na user name tapos wala pala na fillup yong gen average tapos hindi na namin ma unfinalised. Hindi dapat ifinalize yun. SOP yan. Dapat meron communication. Minimonitor ng System Admin nyo through sa school ICT coordinator kung tapos na ang lahat bago nila finalize and enrollment ng school. Kung talaga nafinalize na magrequest lang sa central office through your division planning officer or division ICT coordinator. Ganun lang. Pero hindi ako sigurado kung bibigyan nila ang urgent action yun.